Some Observations by Noel Walley. This paper was inspired by aspects of a ten-week course on "Change and Development in North Wales” organised by Coleg Harlech WEA at the Community Centre, Craig y Don, Llandudno and given in the Autumn of 2001 by Gwilym T. Jones of the University of Wales, Bangor. The paper consists essentially in three essays, one on an aspect of industrial development in North Wales, a second being a perhaps controversial view of agrarian reform and the third an examination of the role of the Chester and Holyhead Railway in the development of the North Wales Coast as a residential area for the Commerce of Liverpool and Manchester. Industrial Development – Thomas Williams & Co.
Great men are often very complex characters and this seems to be so in Thomas Williams’ case. I found his story quite captivating and it was interesting to contrast the opinion of his workmen who called him ‘Twm Chwarae Teg’ (Tom Fair Play) and that of his business rival Matthew Boulton. It was Boulton who first called Williams the ‘copper king’ – ‘the despotick sovereign of the copper trade’. To his friend and agent he said ‘Let me advise you to be extremely cautious in your dealings with Williams.’ He spoke of Williams as ‘a perfect tyrant and not over tenacious of his word and will screw damned hard when he has got anybody in his vice.’ Of the Cornish producers, Boulton said ‘they would not have submitted to be kicked and piss’d on by me as they have been by them’ (Williams & Wilkinson – partners at one time). Williams’ tenacity as a lawyer was very evident when acting for the Hugheses of Llysdulas who were in an acrimonious dispute with Sir Nicholas Bayly of Plas Newydd concerning the Parys Copper Mine. This dispute, which ran for over nine years, involved the interpretation of that very unsatisfactory testamentary device called a moiety. At one stage the dispute involved four years of expensive litigation in the Chancery court with the Attorney General and the Solicitor General acting for opposing sides and was not finally settled until 1778. In that year Sir Nicholas leased his own copper mine to a London Banker John Dawes (a secret associate of Williams) for 21 years. Williams emerged from the dispute as the managing partner with the Revd Edward Hughes and John Dawes in the Parys Mine Company. This under Williams control was cheap to run and extremely productive. His great problem was to obtain an attractive price for the copper. He faced a cartel of copper smelters whose aim was to buy cheap and sell dear. He moved decisively to establish his own smelting facilities and quickly entered into an agreement with John Mackay to establish an industrial complex at Ravenhead near St. Helens in Lancashire. He also established warehousing and copper manufacturing and finishing facilities, and even a mint – thus creating a vertical organisation. He also acted quickly to absorb or control other producers – notably the Cornish mines to produce a complete response to the cartel. Although always the driving force, Williams built up and controlled a major commercial organisation and surrounded himself with able staff. The Revd Edward was always a sleeping partner but younger brother Michael Hughes was an able manager. Other partners and staff included The Earl of Uxbridge, Owen Williams, and Thomas Harrison. His business organisation was first rate. He developed the technique of establishing his various businesses in separate companies. Thus the Parys Mine Company controlled its own smelting in South Wales and Lancashire and copper manufacture at Holywell. Likewise the Mona mine output was smelted by the Stanley Company in both Lancashire and South Wales. Other Companies dealt with manufacture at Greenfield and in the Thames Valley, Chemical Works (vitriol) at Garston Liverpool and still others with Warehousing and Banking. The Parys Mountain web site was a very helpful source of information on Thomas Williams & Co. Williams had built copper works at Flint and Penclawdd where he made copper and brass products. Many of these materials were for use in the African slave trade. These copper trinkets etc. were largely exported to Africa for use as payment for slaves, who were then transported to the West Indies and sold. The proceeds were then used to purchase commodities for import into Britain. Williams claimed to have invested £70,000 in this trade and petitioned parliament in 1788 when a bill was being discussed to prevent British ships from carrying slaves. Williams is said also to have introduced the use of copper bolts to fix the copper sheeting to naval vessels and it would appear that he sold them to all sides in the naval conflicts! Thomas Williams of Llanidan was clearly a complex character; some would say an unscrupulous cheat. Certainly he was a decisive man who could and did act quickly, as on the occasion when, without regard for his depositors, he closed the doors to pre-empt a run on his Chester and North Wales Bank. When he died in 1802, 1,200 people were employed in his Parys and Mona mines, but five years later the number had dropped to 120. This owing partly to the collapse of copper prices, but also to the exhaustion (so it was said) of the known local copper deposits – but no doubt largely resulting from the death of the firm’s great driving force. This session raised for me more problems than it solved. That there was a clear need for reform in the 18th century was undeniable and the story was well told. What wasn’t clear was why this should be so and I allowed myself free rein to consider the matter more fully. There was a significant shortage of food for labouring people – food is always available for those with money. Thomas Williams apparently complained that the villagers on Anglesey raided his fields and stole the turnips intended for cattle and used them to feed their families. It is also clear that in the implementation of the agrarian revolution, there were losers (notably dispossessed ‘commoners’ who were no longer able to enjoy their traditional rights to graze etc. on the newly enclosed common land, and those labourers who were no longer needed on the ‘mechanised’ farms) as well as those who gained. Undoubtedly in the short term this was so. But better work almost invariably came along and even the losers benefited. In a different part of Britain, in the early 19th century, very young boys were asked by social workers, in an official government inquiry, about their then legal employment. Those who worked in coalmines said (to the great surprise of the interviewers) it was hard work but better than working in the pottery industry. Those employed in the local potteries said it was hard work but better than being on a farm. The juvenile farm labourers, poor souls, said it was very hard work, and poorly paid, but it was all that they could get. Agriculture, unlike field sports, has always had an unattractive image and low wages. Agriculture was the great gift to the world of the Mesopotamians and they developed considerable skill in the efficient sowing of crops – recording some quite remarkable yields. The Romans introduced to Britain cultivation and husbandry on a large scale and by good organisation and management (and indeed some early mechanisation) they were able to secure the very high yields (much higher than subsequently) that were needed to meet the heavy demands for food and wine of the resident army, the multitude engaged in metalliferous mining, and both the rural and the increasingly urbanised native populations of Britain; together with a surplus for export. In the centuries following the collapse of the Romano-British civilisation, England and Wales in common with the rest of Europe lost the art and the skill of high-yield agriculture even to the extent of being unable adequately to feed their own populations – something of which the United Kingdom even in 1940 was desperately aware. Additionally, in the post Roman era, Wales had to cope with refugees coming from the east, many of them educated, and with little potential for increased food production, there was a great need for population control. Providentially, celibacy, through the establishment of large monastic communities that made a virtue of frugality and poverty, did much to prevent an unfeedable population boom. In the 6th century, over 2,000 monks followed the rule of Saint Deiniol at Bangor Iscoed, with even more in his foundation at Bangor Fawr. Also there were several large monasteries in South Wales, together with many smaller monastic foundations and very many individual eremitic cells throughout the length and breadth of Wales – these numbers were very significant given the relatively low populations of the day. The arithmetic of population control through celibacy is easy to establish – early death on the battlefield has a similar outcome. This use of the church for population control was fortuitous rather than planned, indeed the churches were and are traditionally opposed to birth control, but down the centuries and from an early date the monasteries were undoubtedly used as population and inheritance regulators [e.g. sons – the first to the family title, second to the church, third to the army, fourth to a trade etc., to prevent fragmentation of estates with consequent loss of power – Welsh traditions, I understand, were rather different – but some Welshmen did become monks for family reasons]. A notable case was that of the Welsh Henry VII whose second son Henry was intended to become a future Archbishop of Canterbury and therefore was given a thorough religious education before the untimely death of his brother Arthur made him heir to the throne. The Anglo-Saxon kings had also been adept at using the monasteries to accommodate and regulate surplus princesses and royal widows. The traditional Anglo-Saxon Royal monastery was a double monastery of monks and nuns living in entirely separate houses on the same site but jointly ruled over by a Royal or a Noble Abbess. The monks celebrated Mass, studied, wrote and provided the spiritual direction for the community. For their part the lay brothers would do the heavy work of the monastery including maintenance of the abbey buildings, labouring on the abbey farm and managing the extensive outlying estates as well as providing protection from attack for the monks and also for the nuns. Their duties would include the production of elaborate needlework for the abbey and the Royal Court. There were also lay sisters who acted as servants to the nuns. All took part seven times a day (lay brothers and sisters often just two or three times) in the recital of the Psalter – the monks in the abbey choir and the nuns generally in their own chapel. Meals, often frugal, were taken in silence (or while a monk read aloud from a pulpit) in the refectories attached to the separate monks and nuns quarters. From about the tenth century completely separate men’s and women’s abbeys became the rule. Novice monks would spend many hours each day in their studies. Monks would also serve as tutors to the sons of Royalty, nobility and gentry. Inadvertently, monks and nuns, who were almost always recruited from upper class and educated circles, made a significant contribution to birth control (as also did their many celibate servants) and this was lost at a stroke in the 16th century. The suppression of the religious life during the ecclesiastical reformation under Henry VIII, and later, under Edward VI, the suppression of the chantry chapels and schools and the abolition of compulsory celibacy among the clergy, led to a steadily increasing population especially among clergy families and the ruling classes who generally expected and therefore secured a far better than average standard of living. The great monastic and chantry estates, ‘privatised’ by the government of the day, would be insufficient to support the overburden of families (children, grandchildren, great-grandchildren) in exponential growth of those who were no longer given the opportunity of a celibate religious vocation. The 10,000 parochial clergy of Britain (and their successors) freed from life in a celibate household, with celibate servants, quickly established large families, which generally chose to live well. Perhaps it is no coincidence that the subject attracted the attention of many of the post-reformation clergy. In the event, population in England & Wales rose from under 4,000,000 at the start of Queen Elizabeth’s reign in 1558 to 5,500,000 at the start of Queen Anne’s reign in 1702 and then rocketed to 9,000,000 by 1801. It is not said that this is the result of the abolition of clerical celibacy, only that the latter was a factor. It is now recognised in many church circles that, notwithstanding the spiritual value of self-denial, the real aim of ‘fasting and abstinence’ was to limit food consumption in order to conserve food stocks and in particular to ban the eating of meat, including eggs, in the early spring – when in fact little was available – in order to preserve the breeding stocks. It is very noticeable that the Friday, Lenten, and Vigil fasts were not changed in the 16th and 17th century church reforms and continued to be rigorously enforced by government decrees during the Elizabethan and Stuart periods. They are all specified in the tables at the front of the 1662 Book of Common Prayer and amount to about 120 days each year on which the eating of meat was totally forbidden by law and frugality was encouraged. This was of course the situation not just in Britain but also throughout Europe – Catholic and Protestant alike. It accounts for the high demand for fish (not regarded as flesh meat – unlike game and poultry) on Fridays and especially during Lent. During Elizabethan times, these days were actually called ‘fish days’ and the object was clearly stated to be the protection and encouragement of the fishing industry (an essential part of the navy in time of war) and also to limit the consumption of beef and mutton and therefore the amount of arable land being converted into pasture. These fish laws were enforced in the Courts in all parts of the kingdom and the pillory was considered an appropriate punishment for women offenders. By the mid 18th century, the old Lenten fasting disciplines had broken down (except in Catholic Countries) resulting in further food shortages amongst the poor. Population was growing rapidly and Agrarian reform, long overdue, was inevitable. The value of Thomas Telford’s work in constructing turnpike roads and especially the A5 to serve North Wales cannot be overestimated. Before his day, almost all inland transport was by packhorse and coastal sailing vessels were used for longer journeys. If only the Caernarvonshire Turnpike Trust had been possessed in 1777 of the courage and the resources of its convictions, then what a marvellous difference their proposed reopening of the ancient Roman Road from Tal-y-cafn via Bwlch-y-ddeufaen over the high pass (about 1400 feet) to Abergwyngregyn might have made. It would have transformed the Chester & Holyhead route! It could still be done! There is a third Conwy Bridge between first and second. This bridge carried a water supply pipe and was built during the first decade of the 20th Century lasting I understand until the fourth bridge was completed. 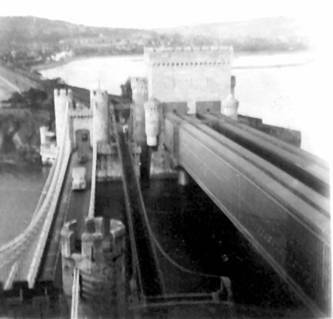 The fourth on the left of the first was still a pipedream when I took this snap from Conwy Castle Walls c1952. Good train services between the North Wales Coast and Manchester Exchange encouraged affluent Manchester businessmen to establish their homes on the coast and commute daily to their work in the city. In this way the Manchester men could emulate the life style of many of their London counterparts. The ‘Llandudno to Manchester Club Train’ was the fastest service on the line and those who purchased first class season tickets had the added incentive of being able to apply to join the travelling club. This was similar in many ways to a city gentlemen’s club and closely regulated by its members who had the right to exclude all undesirable travelling companions. [Similar facilities were enjoyed on the Manchester to Blackpool and Windermere Club Trains]. The service started in the early years of the 20th century and the London & North Western Railway and its successor the London Midland & Scottish provided special saloon cars dedicated to the use of first class season ticket holders. The saloons were serviced by an attendant who would ensure that a member’s favourite armchair was kept free for that individual’s use. Members enjoyed the benefits of newspapers and light refreshments en route to and from Manchester. During the inter-war years two massive smooth riding twelve-wheeled bogie saloons as used on the London – Liverpool Atlantic Boat Trains were provided for the Llandudno Club service. These cars were the equals of the Pullman Cars then in use on the London, Brighton & South Coast Railway. The train started from Llandudno at 7:48 am and picked up at the Junction, Colwyn Bay, Abergele, Rhyl and Prestatyn. It called at Chester and Warrington and reached Manchester Exchange after two hours and nine minutes at 9:57 am. The return service left Manchester Exchange at 4:30 pm and with the same stops reached Llandudno at 6:38 pm. On both outward and return journeys the average speed (including station stops) was over 40 m.p.h. The train continued to run throughout the war but without the club saloons and to a slower timetable. After the war the service returned to a faster schedule but the club saloons were not re-introduced. Liverpool and Birkenhead also had through commuter trains from Llandudno in the inter-war period and through to the 1950’s. These express services, which were also available to third class passengers, did much to establish the North Wales Coast as a suitable residential area for Lancashire and Cheshire businessmen and traders. The club car facilities encouraged the bankers and the captains of industry and commerce to set down domestic roots in North Wales, to the great benefit of their families and also of the local economy. Today Liverpool and Birkenhead have a frequent connecting electric train service to and from Chester now reached in about an hour on the hourly air-conditioned service from Llandudno to Manchester average journey time under two hours. London and Birmingham are now provided with greatly improved train services via Crewe where connections are available to many other parts of the kingdom. Indeed, the trains are now faster and more frequent than at any previous time – see the tables below. First the industry must be of a size and pattern suited to modern conditions and prospects. and the modernisation plan adapted to this new shape. For a task of such importance, not just for the Railways but for the nation, one can be excused perhaps for being surprised at the document’s brevity. In a mere 60 pages is analysed the existing state and future prospects of the passenger, freight and parcels services of the railways, and from that analysis were drawn conclusions, the implementation of which has had and still does have a fundamental effect on public transport in Britain. In some ways the Beeching report and Dr. Beeching’s very short chairmanship (less than four years ending in May 1965) were valuable in that they forced the railways to improve efficiency and to concentrate their resources where they could most effectively generate income. Also, and this may seem surprising given all that has been said about him, it is recognised that during his period in office there was a significant improvement in morale (attributable largely to Beeching’s personality and management techniques) amongst railwaymen at all levels and especially in the upper managerial levels and that despite some resentment at the influx of experts from outside the industry (views largely expressed by Robert Adley). But note also the report to Parliament was 65 pages long. Most Parliamentary reports, before and since, spend the first 100 pages on the preamble. Parliament acted on that insult as the writer proposed, yet failed to learn from his brevity and his managerial skills. Yet the railway system did. My original home was in Crewe, and I can identify with the above from personal experience, having worked for British Railways ten years, (apart from two years in the RAF), until I moved in 1959 to Stoke-on-Trent Corporation. Morale was indeed at a very low ebb in the late 1950’s, when Senior accounting men at Crewe still bemoaned the LNWR’s takeover by the Midland in 1923 to form the LMS. Dedicated railway operators have always run the railways with great professionalism and since nationalisation massive strides have been made to upgrade and improve the railway service. Much damage was done, however, following Beeching because changes of a fundamental and irreversible nature were made to the railway network and the railway infrastructure for relatively small short-term financial considerations. Many of the closures made under Beeching, especially of lines which appeared to be lightly used duplications of other routes, are now regretted, not least because valuable linear rights of way have been lost in piecemeal disposal of railway land. However, with the dead wood dramatically cut away, the trunk lines were able to concentrate on that which they do best – fast and frequent ‘Intercity’ services (an entirely British concept of c1970 – later imitated throughout the world, and even to the extent of copying the name) between railheads and major centres of population, commerce and industry. Everyone knows of Dr Beeching yet few would be able to name Sir Peter Parker, Chairman from 1976 to 1983, who recognised the social importance of the railway network and the obligations arising there from. He was an energetic chairman and a persuasive advocate of railways and did much to ensure continued public financing of those railway services that were deemed to be socially necessary. In retirement, he is an official Patron of the Ffestiniog Railway Company (one of six named by the company). Welsh lines that owe their survival to Sir Peter’s social railway policy include the Shrewsbury to Aberystwyth, the Cambrian Coast, the Heart of Wales (Shrewsbury – Llandrindod – Swansea), Wrexham – Shotton – Bilston (Birkenhead), and even the Chester – Wrexham – Shrewsbury. The following table illustrates some of the very great improvements made in the North Wales Coast passenger train services arising from the ‘Social Railway Policy’ promoted by Sir Peter Parker and largely resulting from his proposals, but with continuing improvements over the years. About three quarters of the trains operating these passenger services have been replaced within the last five years by fast modern air-conditioned trains in a massive ongoing investment programme. Train times have been obtained from published winter timetables for 1947 and 2001. 1947 was the last year of operation by the LMS prior to nationalisation (the 1947 summer timetable would have shown a few extra trains, especially on Saturdays). The numbers of through trains are shown together with the best journey time available. Further study would show that the passenger service in 1947 was very similar to that of 1939 or 1924 or indeed 1910. There were very few improvements during the 1st half of the 20th century; since steam operated railways had by 1910 effectively reached the limits of economic development. Almost all trains normally take less than two hours. J. R. Harris, The Copper King: A biography of Thomas Williams of Llanidan (Liverpool University Press, 1964). Several web sites were useful including http://www.angleseymining.co.uk/ParysMountain/AHT.htm which is the official Amlwch Industrial Heritage Trust site, and http://www.rhosybolbach.freeserve.co.uk/ being the site of the Parys Mountain Underground Group, which is dedicated to the archaeology of the site. Some Welshmen did become monks for family reasons – a good example of this was our very own Saint Tudno about whom Margaret Williams & T. F. Wynne tell us that Tudno was one of the seven sons of king Seithenyn whose legendary kingdom in Cardigan Bay was submerged by tidal activity. Each son in reparation for his father's neglect (so it was seen – for ‘Seithenyn and his court had given themselves up to eating and drinking, and that greater wickedness – insolent pride of heart’) studied in St. Dunawd's college at Bangor Iscoed. Four sons became monks and missionary hermits. G. M. Trevelyan, O.M., English Social History (London, Longmans, Green & Co., 1942 & 1955) Ch XI page 341. The Book of Common Prayer according to the Use of The Church of England (London, Eyre and Spottiswoode Ltd) A Table of the Vigils, Fasts, and Days of Abstinence to be observed in the year. G. M. Trevelyan, O.M., English Social History (London, Longmans, Green & Co., 1942 & 1955) Ch VII page 189. Henry Rees Davies, A Review of the Records of The Conway and the Menai Ferries (Cardiff, University of Wales Press, Board of Celtic Studies, History and Law Series, No. VIII, 1942 and 1966) page 205. Cecil J. Allen, Titled Trains of Great Britain (London, Ian Allan Ltd, 1946), page 19-22. British Railways Board, The Reshaping of British Railways - Part 1: Report and Part 2: Maps (London: H.M.S.O., 1963). Robert Adley, Out of Steam: The Beeching years in hindsight (Wellingborough, Northants: Patrick Stephens Ltd, 1990), page 34. LMS Passenger Services – October 6th 1947 until further notice, (Manchester, Henry Blacklock & Co. Ltd., 1947) – Table 99 pp 114-121. First North Western Trains – 30th September 2001 to 6th January 2002.